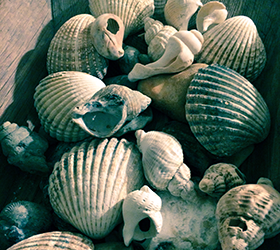 Take inspiration from Pinterest and get crafty with shells from Dorset's shores. Dorset’s many miles of coastline are a treasure trove for crafters, with a bounty of driftwood, sea glass and shells all readily available. A simple stroll on the beach can quickly become a race to collect these little treasures washed up at our feet, as our minds explore what new trinkets we can create when we get home. We always make sure we’ve got a recyclable or reusable bag stowed away for such days so we never miss an opportunity. Before we start getting creative it’s important to make sure you prepare your shells before getting crafty with them. Shells picked up from a sandy beach need cleaning, polishing and preserving inside and out for best results. This handy guide will tell you how to clean and polish your sea shells. After cleaning and polishing your shells, it’s time to think of what to do with them. Shells can be used to create an endless range of house and garden wares; the only limit being your own imagination, and perhaps time! Wreaths, candle holders and lanterns are a great way to showcase your crafty skills for maximum impact. Find inspiration for your next shell craft project on the Dorset Tea Shell Crafts Pinterest board. Of course, if you can’t get to the coast to find shells yourself, you can always buy shells online. Dorset Gifts have a wide range of shells, starfish and driftwood available to buy online plus a range for hire and weddings. The English Stamp Company also have a wonderful range of seaside inspired stamps, including scallps, sea shells and starfish all of which can bring another creative element to your crafts. Whatever you create, getting crafty with shells is an effective way to bring a touch of the Dorset coast to your home, wherever you may be. Grandchildren coming over the Easter holidays so this information was so useful. Thank you.